Here are eight projects our teams tirelessly built and stood out for their creativity, impact, or technical complexity. They range from products improving engagement, mobile, moderation, and more. Let us know what you think of the projects in the comments below! Subscribe to browser notifications of Disqus activity including replies, mentions, and upvotes. Similar to mobile push notifications, browser notifications only require that you have a supported web browser (Google Chrome and Firefox on Windows, Mac, Linux, and Android). It makes discussions feel livelier and brings readers back to your site. We rebuilt our recommendation engine, Discovery, using better taxonomic information to provide more relevant and engaging suggestions. We trained our own NLP algorithm, resulting in more relevant recommendations in testing. So if you're reading about the iPhone for example, you'll find recommendations of iOS 11, smartphone cases, and Apple. An iOS software development kit (SDK) that publishers with mobile apps can use to easily integrate Disqus into their native applications in just a few steps. The highlight reel for your community’s discussions. 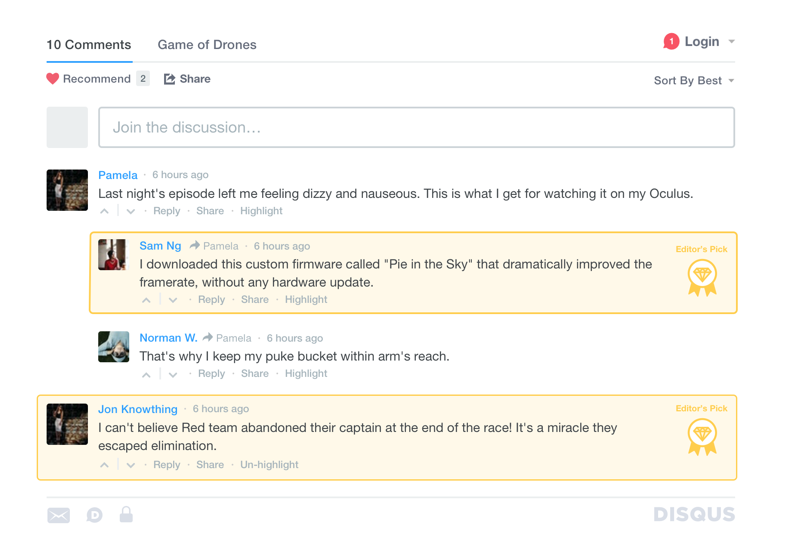 This makes it easy to curate the best comments in any discussion by removing the one comment limit for Featured Comments. Use this to spotlight and reward quality contributions that can foster more engagement from readers. An 8-bit game featuring our mascot, Pam, created using Unity. While not all projects become full-fledged products in the future, it’s an important step in how we roadmap and prioritize what we build. If you found any of the projects interesting, share us your thoughts on why it would be valuable to you. We read every comment here and look forward to hearing from the community.